My eats today weren’t of any note…I had a really bad stomach bug for most of the day and ate mostly oatmeal, toast with almond butter, and water-based fruit like watermelon and oranges. It hasn’t gone away totally yet but it didn’t stop me from attending a very fun cookout at my best friend’s boyfriend’s house. I enjoyed 2 vegan Boca Burgers along with a delicious vegan strawberry salad my best friend made, as well as a few chips with salsa. Also the cookout gave me a chance to flex my vegan muscles and make a recipe I’ve been eyeing for a while. I made some changes to the original recipe, which can be found here. For my changes, see below! In a food processor, grind the hazelnuts until a coarse meal. Stop before it begins to go buttery! Add the flax, cherries, dates, and agave and process until it forms a ball of dough (it’ll take a few minutes, be patient). Add the cocoa powder and process again until totally mixed. Spread onto an 8×8 dish (it’ll be incredibly thick). FMFF’s recipe calls for avocado, and I did purchase an avocado today at the market, however it’s incredibly underripe and not suitable at all for frosting yet. So I ended up using a medium-sized banana. Mush the banana until smooth in a bowl, then add 2 tbsps cocoa powder and 1 tbsp agave nectar, and stir until fully combined. Spread over brownies, and refrigerate until set and ready to serve. 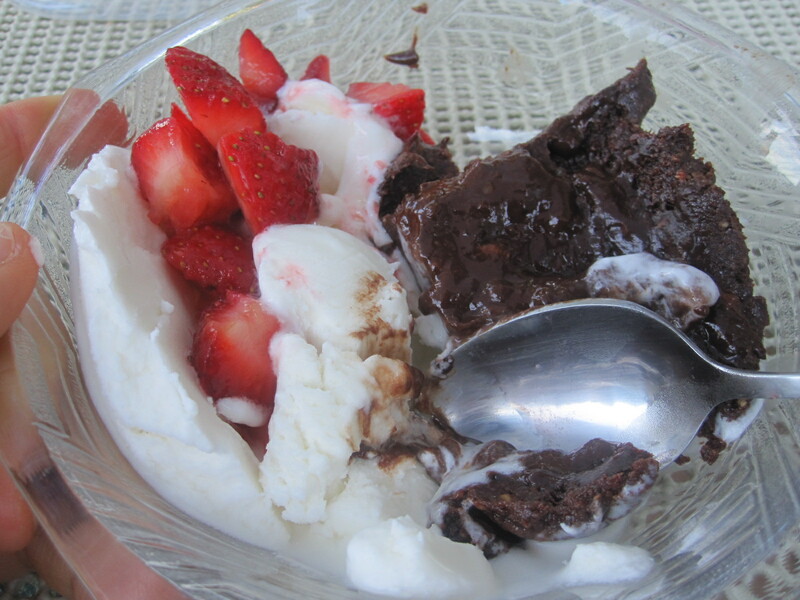 Serve plain, or on top of vegan frozen yogurt with strawberries, like we did! These were so fudgy, rich and delicious. Like a chocolate Larabar, but fresher. They definitely had an energy-bar taste to them, as my best friend’s boyfriend remarked, but that didn’t stop him or our mutual guy friend from eating a few pieces. I enjoyed 1.5 pieces, plus I picked at the pan. I ended up having to throw the rest away since I knew I’d dig into it and eat the whole thing (thankfully there wasn’t a lot left!). The banana frosting was absolutely delicious, but I can’t wait to try it with avocado. Perhaps I’ll also try the avocado cupcakes I saw one time over on Oh She Glows?